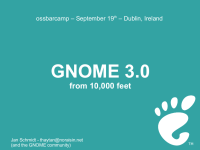 I gave a talk at the second Dublin OSSbarcamp yesterday. My goal was to provide some insight into the goals for GNOME 3.0 for people who didn’t attend GCDS. Actually, the credit for the entire talk goes to Vincent and friends, who gave the GNOME 3.0 overview during the GUADEC opening at GCDS and to Owen for his GNOME Shell talk. I stole content from their slides shamelessly.